Amidst a very intense and unrelenting thriller crafted so beautifully by Alfonso Cuaron, there is a scene that will stay with me forever, high in my all-time favorites. It comes at the most violent and gruesome part of the film as a group of military forces discharges all of their might into a decrepit-looking building that has been invaded by gypsies first, and by a group of persecuted rebels second. 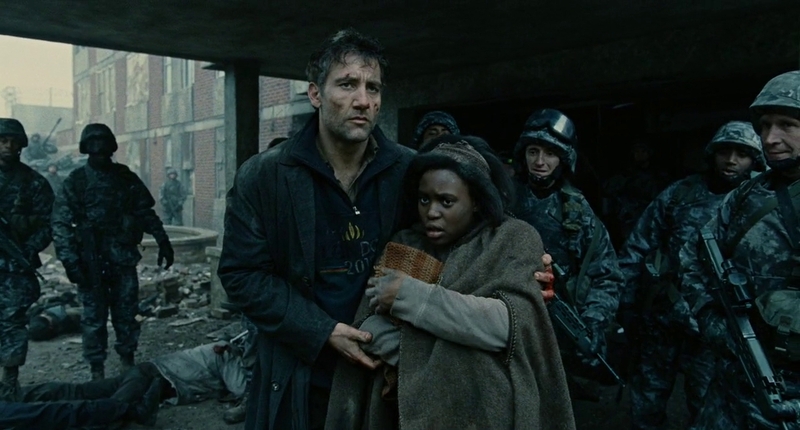 Most of the action takes place inside the building that seems just about ready to collapse as we are following Theo (Clive Owen) through the chaos, frantically searching for Kee and her newborn. There are dead bodies scattered throughout, debris everywhere, as walls continue to crumble to the unrelenting power of shells and battery. At first, Theo searches for bodies, expecting the worst as he moves along, stumbling, tired, injured and sweaty. His search suddenly follows a vague sound, almost a whisper at first. It is a sound that had not been heard in over a decade in a near-apocalyptic world: the sound of a newborn crying. As his search gets closer to the end, the fear and desperation in Theo are palpable in an all-engrossing spectacle of horror, action and great suspense. Not before a couple of more close-calls with death, Theo finds Kee and her crying baby who, by now, has managed to bring the gypsies trapped inside to their feet, amazed at the beautiful specimen some of them had never seen. Some try to touch and others pray, moved by the hope of new life. As they attempt to somehow escape they are greeted on the steps by the military who, like the people they are trying to kill, can’t help but be in awe of the miracle that managed to survive the mess. It brings them all to a halt, silently amazed by the tiny creature, war stopped, if only for a second, uniting everyone through the beautiful innocence of new life. Poetic, all-engaging, intense and beautifully shot. One of the finest moments in the history of cinema. Without a doubt! Very good scene as well. It was definitely a bit of a shock when I first saw the film but the one I picked just impressed me more from an artistic point of view. It was very powerful and it’ll always be one of my all-time favorites. Great scene, great film! 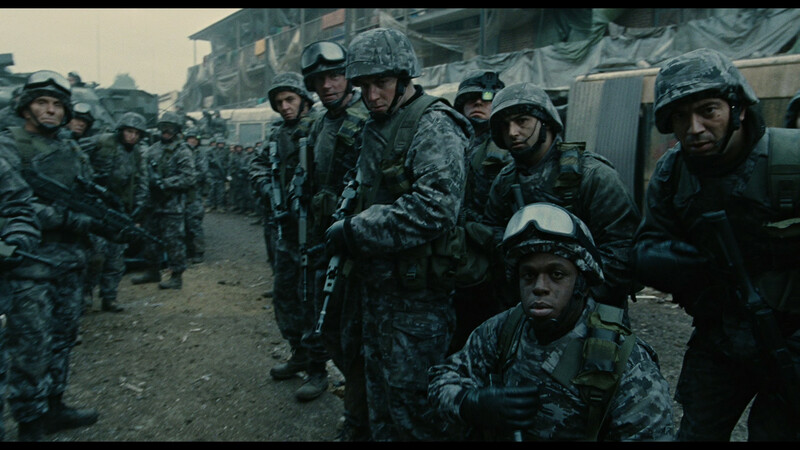 Dystopian post-apocalyptic films rarely fail to get under my skin. This is one of the best. It’s a great film indeed. Definitely one of my favorites. It will surely rank high when I get to posting my top 250 films ever. I love this film. My girlfriend fights with me about it’s merits, but I continue to tell her it’s one of finest Science-Fiction films ever. The cinematography captures my soul. Awesome write up. I agree, this is a well-crafted and emotionally-engaging film. It started off with a bang and didn’t let go. I think it’s one of my fave Clive Owen roles, I hope he’ll do something like this again as his latest offerings don’t interest me. Such a great film, one of the few that I can watch over and over and not get bored. I know it has been said before but I want to say it again – the cinematography on this film is ridiculously amazing. I love the whole story of a man finding his purpose. Yes, best Clive Owen performance to date.